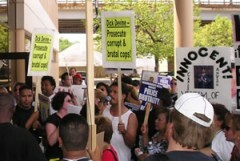 Chicago Cops Face Lawsuit for Framing Angel Rodriguez | Fight Back! Chicago, IL - In 1997 Angel Rodriguez was framed for murder by Chicago Area 5 Detectives Jon Woodall and Ernest Halvorsen. He was convicted and sentenced to over 60 years in prison. After almost four years in prison for a crime that he did not commit, Rodriguez’s conviction was reversed on appeal in March of 2000 because of lack of reliable evidence. Rodriguez was released from prison due to the fact that the eyewitness who had originally identified Angel as the murderer recanted his story. The witness gave a sworn affidavit stating that Area 5 Detectives Woodall and Halverson had pressured him into identifying Angel. The eyewitness stated that Woodall and Halverson threatened to implicate him in the murder unless he pointed the finger at Angel. Detective Jon Woodall is now in prison on a ten-year sentence after being convicted over a year ago of framing a different individual. Woodall was convicted of stealing cocaine, planting it on an innocent man and then falsely arresting him. Even though Angel Rodriguez now is a free man, no one has ever been held accountable for the damage this frame-up inflicted upon him and his family. Detectives Woodall and Halverson have never been punished for framing Angel Rodriguez. Rodriguez filed a lawsuit against Detectives Woodall and Halverson and the City of Chicago for compensation for the years he has lost and the damage to his life. U.S. District Court Judge Matthew Kennelly has denied Woodall and Halvorsen’s motions to dismiss the case and has ordered the trial start Apr. 11. At a press conference announcing Rodriguez’s trial, activists from Comite Exigimos Justicia (CEJ, the We Demand Justice Committee) and supporters spoke out about the injustice that Angel and the countless other wrongfully convicted Latino and Black men face. Activists highlighted an unacceptable flaw in the Illinois criminal justice system - the fact that although Rodriguez was exonerated of the murder conviction in 2000, the conviction still remains on his record, making it hard for him to find a job. In order to clear his record, Rodriguez filed a petition for clemency 18 months ago. Illinois Governor Blagojevich has yet to grant the pardon to clear Rodriguez’s name. Activists point to other instances where wrongfully convicted men wait for pardons by Governor Blagojevich. Two examples are the separate cases of Walter Godinez and Juan Johnson, wrongfully convicted of murder by Chicago Area 5 detectives, and later exonerated in court and released from prison. Yet both men also still have murder convictions on their records. CEJ has documented over 50 cases of frame-ups by Chicago police officers working out of Area 5. All of the cases resulted in convictions of Latino men based on eyewitness testimony alone. No physical evidence was ever presented to link these men to the crimes. The vast majority of these cases involve the same Area 5 Detectives: Woodall, Paulnitsky, Halvorsen, Wojik and, the most often named, Detective Reynaldo Guevara. Area 5 is also the home of Detective Joseph Miedzianowski, Chicago’s ‘most corrupt cop,’ who was found guilty of drug conspiracy and racketeering in spring of 2001. The Comite Exigimos Justicia is asking for any supporters available the week of April 11-15 to attend Angel Rodriguez’s trial at the Dirksen Federal Building, 219 S Dearborn, Room 2103. Please email Comite Exigimos Justicia at [email protected] for more information.